Doug MacKay in his workshop. A worker preparing water samples. 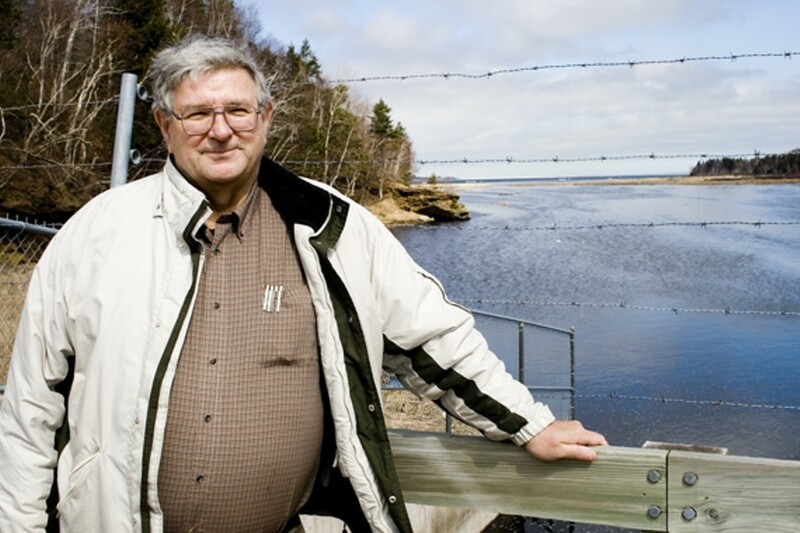 Former Canso Chemicals engineer Bob Christie went green. Pictou County can breathe a sigh of relief. On March 26, one of the county's main employers got an emergency lifeline. The pulp mill at Abercrombie Point will be kept afloat with a $15 million loan from the provincial government. The loan will help the mill deal with falling demand for its white mushy pulp, used to make paper. The deal looks good, $15 million for more than 1,200 direct and indirect jobs---but there's a hidden cost. Most of those indirect jobs go to people who harvest the piles of trees that sit in the mill's wood lot. Reducing trees to soft, white mash takes a monumental amount of water. The water is clean when it enters the mill, but at the other end, it's dark brown. That dark brown wastewater, and where it goes is where you'll find the true cost of those jobs. Since 1967, the wastewater has flowed into Boat Harbour, a quiet estuary near Pictou Landing, two kilometres east of the mill. There, oxygen is added to the water, the solids are settled out and thewater makes its way to the Northumberland Strait over about 30 days. Boat Harbour borders a native reserve, the Pictou Landing First Nation. Forty-four years ago, the federal government gave the province permission to treat the mill's waste in Boat Harbour. In December 2008 the band demanded the Province clean up Boat Harbour and put the waste somewhere else. The province agreed. Now, secret talks are just underway to decide how that will happen. One thing is certain: It will cost lots of money. A new facility will cost about $100 million, and dredging Boat Harbour of its toxic sediments will cost another $7 to 12 million. All this money is for a pulp mill that is already taking emergency loans. During our investigation we found more than four decades of promises broken by a succession of governments and agencies, leaving a toxic mess with no solution in sight. Boat Harbour's history as a waste treatment lagoon began in a murk of lies and betrayal. These lies have haunted successive governments to this day. Lies like residents being told the wastewater would have little impact on the environment. And officials telling band councillors face-to-face they would be able to drink the water in the estuary. And the promises in 1993, 1995, 2002 and 2006 to stop using Boat Harbour, deadlines that passed with wastewater still flowing into Boat Harbour. Even the provincial government acknowledges this problem has gone on too long. "Many deadlines have come and gone, I'm the first to admit that, it may be somewhat disheartening," says Brook Taylor, minister of transportation and infrastructure renewal. Taylor's department is part of those closed-door talks to close Boat Harbour. Right now, the government is studying other locations to put the wastewater. But Boat Harbour has been studied so much it's not hard to imagine consultants making careers out of the place. Before the mill, locals enjoyed Boat Harbour. They could boat, fish and swim to their hearts' content. "I learned to swim off a little island that was known as Pine Island," said Doug MacKay, who has lived in Pictou County for 75 years and has owned a house on land that borders Boat Harbour since 1958. "Clams and shellfish abounded out there at that time," he recalls. 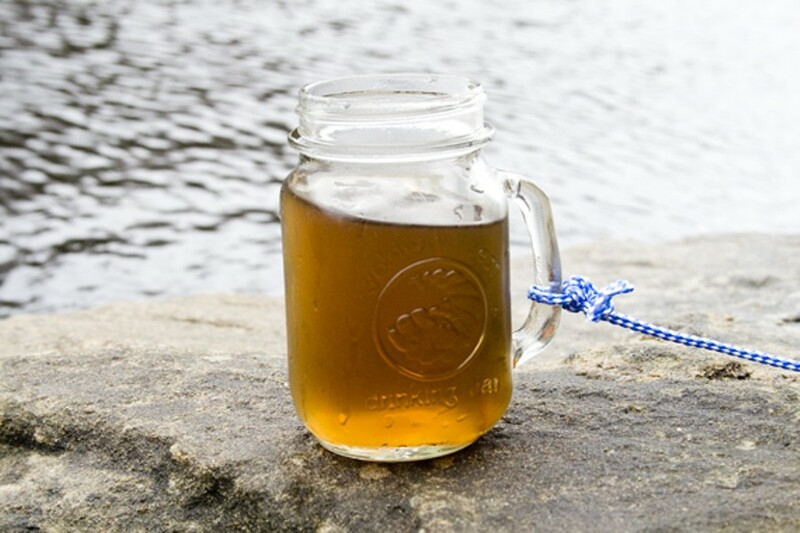 "You know, it was common practice that people would dig a bucket of clams and have a fire on the shore and cook them right there with the salt water." Mary Gorman's family has a cottage at Pictou Landing. She remembers when it changed. "All the waves that were coming in were dark brown and foamy, they were not like the ocean coming in, they were dark brown foamy waves," she recalls. Nearly a trillion litres of wastewater have gone into the lagoon over the years. To see that much water go over Niagara Falls, you would have to watch it 24 hours a day, for two years. All that toxic water has a profound effect on Boat Harbour and the people who live around it. When the mill was built, Pictou County needed its jobs more than ever. The coal industry was in steep decline and premier Robert Stanfield's government was searching for replacement industries. Enter Scott Paper. Scott got a sweet deal. The province gave Scott cheap water, free water infrastructure, cheap wastewater treatment, property tax exemptions and a huge tract of crown land. The company paid $50 million to build the mill in 1965---that's $342 million in 2009 dollars, about the cost of Halifax's Harbour Solutions project. Building the water infrastructure for the mill fell to the newly formed Nova Scotia Water Authority. The authority was created in 1963 to administer and oversee all water in the province. Pulling the strings at the Water Authority was John Seaman Bates, a chemical engineer and a lifetime friend and employee of the pulp and paper industry. When Bates became the first head of the water authority, he had been chief chemist for mills in Quebec's Saguenay River Valley, was technical advisor to more than a hundred mills in the British Isles and had his own consulting firm that set up bleached kraft mills around Canada. Today, the Pulp and Paper Industry Association of Canada has two awards named after Bates. The mill would need 112 million litres of water per day to produce its pulp. On the toilet end, the province needed somewhere to flush the waste. At first, Pictou Harbour was the dumping ground of choice. But Bates devised a plan that would protect the harbour at the expense of a tidal lagoon. Later, in October 1966, Bates explained his views on pollution control to the technical section of the Pulp and Paper Association of Canada. 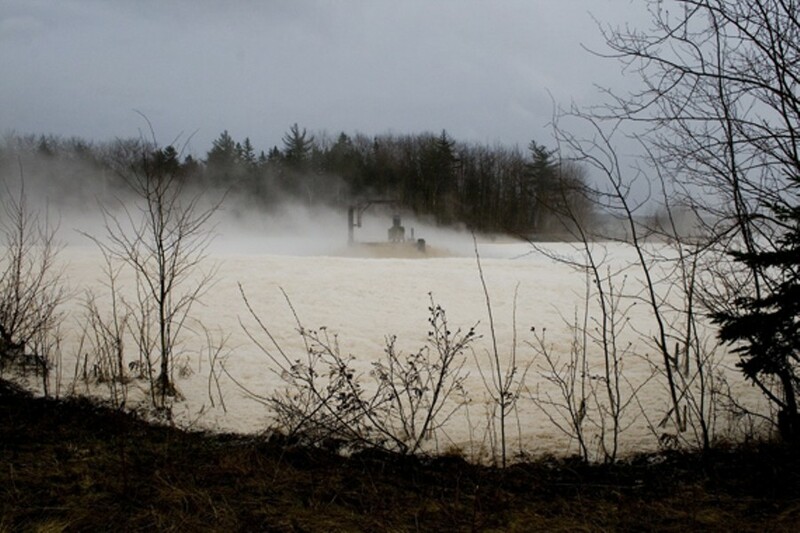 Bates said of mill waste: "The used water carries solids, solubles and toxic substances, often in quantity and condition too staggering for polite conversation... bleached kraft effluent is the most dangerous in our industry." Bates felt the dangerous waste better belonged in Boat Harbour, next to a native reserve, than in the open harbour. On May 18, 1965, Bates outlined his big plans for Boat Harbour to the rest of the water authority and to premier Stanfield. The place would go from natural tidal lagoon, to waste dump for both human and industrial sewage. 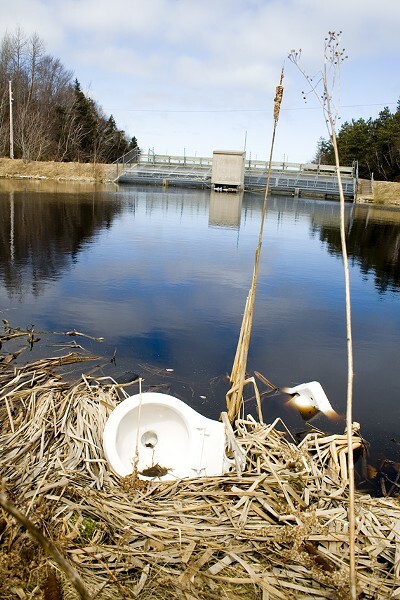 The human sewage would be pumped in from the towns of Pictou, Westville, Stellarton, Trenton and New Glasgow. The industrial sewage would come from Scott Paper and any future industries on Abercrombie Point. The minister responsible for the water authority, W.S.K. Jones, later pointed out federal government approval would be needed to use Boat Harbour. Boat Harbour borders the Pictou Landing reserve, and native affairs are a federal matter. The Water Authority's general manager was given the job of getting the necessary approvals. At a meeting on Sept. 2 and 3, 1965, Armand Wigglesworth reported back about a meeting with the "Mic Mac Indians" of Pictou Landing. They raised "four major objections" to industrial waste in their backyard. But Bates said using Boat Harbour was "absolutely necessary to clean up the entire Pictou harbour." Wigglesworth was told to get that approval. Wigglesworth worked fast; two months later he had approval from local, regional and federal native officials to use Boat Harbour. The band would get $60,000 as compensation for the loss of fishing and "other privileges" related to Boat Harbour. To approve this today would take years of environmental study. But this was the 1960s, when things were done differently. We found out just how differently from Daniel Paul, a Mik'Maq writer and former Indian Affairs official. Paul says the chief and some band councillors were taken to an apparently similar site in Saint John to see what Boat Harbour would look like once Scott began dumping waste there. "They get up there and have the engineer take out a little cup of his sack and take a drink of water and tell him, the band chief and the councillors, this is how pure the water is going to be," says Paul. "And then we discovered afterwards, at that particular place, the unit didn't come into operation for two years after that visit. "The shenanigans that went on were almost criminal." At a water authority meeting on March 9, 1964, Bates said "toxicity from bleached kraft pulp mills [like Scott's] is very high." This information hasn't been published until now. It comes from water authority minutes on record at the Nova Scotia archives. By 1966, Wigglesworth and Bates had both left the Water Authority. Bates' scheme to pump industrial waste into Boat Harbour would have dramatic consequences shortly after the mill opened. Bob Christie used to be an engineer with Canso Chemicals, a subsidiary of Scott Paper and another polluter of Boat Harbour. Now he's an environmentalist. He said the theory behind the Boat Harbour facility was sound. The scale was not. "Rather than using a pile of treatment chemicals it would be a natural living machine," said Christie. "The environment would clean [the wastewater]. But the poor environment, it got hit in the face with a brick." The mill opened on November 14, 1967 and the natural machine didn't work. Soon there was a foul stench that hung over the whole area. It didn't take long for residents, who were told the waste would be pristine, to start complaining. To fix the Boat Harbour pollution, the Nova Scotia government brought in Rust Consultants of Montreal in December in 1969. Outraged residents, service clubs and fishermen wrote angry letters to the consultants. They wrote about foul smells, swarms of bugs and fears for the fishery. "If just a few of us who were unlucky enough to live in the neighbourhood were the only ones affected, we could smile and think of all the money being spent in our community," wrote Cameron Garrett. "But, I say the price is too high. "Our provincial government took the job of handling waste disposal. It isn't doing enough," he continues. "Must we as citizens, because our government is a soft touch for slick talking, allow ourselves to allow them to make a cesspool out of our environment?" After talking with residents and reviewing other reports, Rust said there was a problem with Boat Harbour, but it was an aesthetic problem. To fix the odour, Rust recommended mechanical aerators to add oxygen to the water. The report also said raising and lowering Boat Harbour's water level would take care of the insect problem. Rust dismissed the lobster industry's concerns that mill waste was killing lobster larvae that spawned just outside Boat Harbour. In the early '70s, the province and the mill spent several million of dollars on improvements to the treatment process, the first of many upgrades. The odour, insects and public outcry subsided somewhat, but in private, people were still angry. By the 1980s, the band was fed up with the toxic waste. The leadership had been focusing their lobbying efforts on the provincial government. In the mid '80s Daniel Paul became involved. 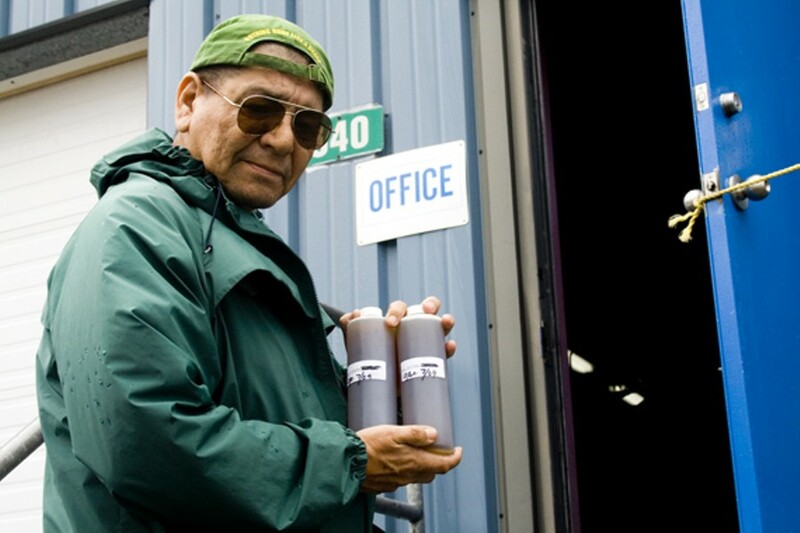 He felt the band should sue his employer, the federal department of Indian Affairs. "[The province] couldn't have done anything unless they had the consent of the federal government. So those are the people you have to go after," says Paul. "If the federal government was acting in the best interests of the band at the time they would have refused it; it's as simple as that." "I was looking out for the best interests of the band at that point in time," explains Paul of his complicated role. "Which was my responsibility as district superintendent of lands, revenues and trusts." The case never made it to court, but in 1993 the band and the federal government agreed to a $35 million settlement. The money dealt only with the federal government's failure to protect the interests of the band in the early '60s. The settlement did nothing to stop the provincial government treating mill waste in Boat Harbour, little to deal with the band's health concerns and nothing to clean up Boat Harbour. The communities' anger and health worries continued. Health worries have fueled Jonathan Beadle's personal crusade against the pollution. He's a native man from Pictou Landing who has been protesting the Boat Harbour waste since he was a teenager in the early '90s. "To see Boat Harbour the way my parents see it would be an awesome thing," he says. "I'd like to see it back to its original state." Today, Boat Harbour is not pristine, but it's much cleaner than it once was---water flowing out of Boat Harbour and into Northumberland Strait is far cleaner than federal standards for pulp mills require. The people of Nova Scotia, however, are still responsible for all the waste dumped into Boat Harbour prior to 1995, after which mill owners Kimberly Clark leased Boat Harbour from the province. The pre-1995 waste sits in sediment on the bottom of Boat Harbour. Repeated tests have shown the sediments contain some of the most toxic chemicals known to science: dioxins, furans, mercury and cadmium. The reserve's wells are constantly monitored to see if these chemicals are leaching into the ground water. These monitoring stations continue to show clean drinking water. But the locals have their doubts. "People get their tap water [from ground wells] but we don't use it," said Beadle. "Nobody wants to use it but it's there." Cathy Felderhof is a physician at the Pictou Landing Health Centre. She says there are many sick people on the reserve but can't say for sure if their ailments are pollution-related. "Skin problems I seem to see a lot of here, boils---that I think I see more here than when I practice uptown," she says. "The health issues---I've thought about that and it's hard to know whether that's mill-related." Non-native residents share these health concerns. MacKay wonders about his wife. "There was never a cleaner living person than she was. She never smoked a cigarette or anything in her life and she developed lung cancer and passed away three years ago," he said. "And maybe it's not even related, but you are highly suspicious of it." The concerns among non-natives go beyond health issues. There is resentment among some that the band got money, but non-natives never got any compensation. Alexander MacKenzie, a white man from Pictou Landing, took drastic measures to draw attention to the issue during the 2000 federal election. "I went to each one of the candidates and said 'I need some support on this, I need this concern addressed and what I'd like to see is a piece in the media that you will address this concern,'" he says. "I didn't get it." MacKenzie took out his frustration on a ballot box. "I just walked out the door with the box, got in my truck, went down the road, threw it and all the ballots into Boat Harbour and I come home and waited for action." Action came quick. MacKenzie was arrested and charged him with disrupting an election. He ended up with 30 days of house arrest and 100 hours of community service. MacKenzie protested the Boat Harbour pollution in Ottawa to serve his 100 hours. MacKenzie repeated the ballot box theft in the 2006 federal election. He was dubbed "the ballot box bandit" by media across the country. Over the years there have been many promises to clean up Boat Harbour. It may be one of the most well-studied environmental problems in the province; literally dozens of reports and studies have been done since the mill opened, especially in the 1990s. Residents thought the pollution would end in 1995, when the original agreement to treat the mill waste expired. But, the province negotiated a 10-year extension to the deal. The government promised Boat Harbour would close by 2005, although that date was not in the wording of the agreement. In 2001 the band signed an agreement with the paper company that saw the band receive almost a million dollars initially and $200,000 a year after that. The company and the province wanted to be sure the band consented to the continued use of Boat Harbour. The band ratified the deal in 2002. 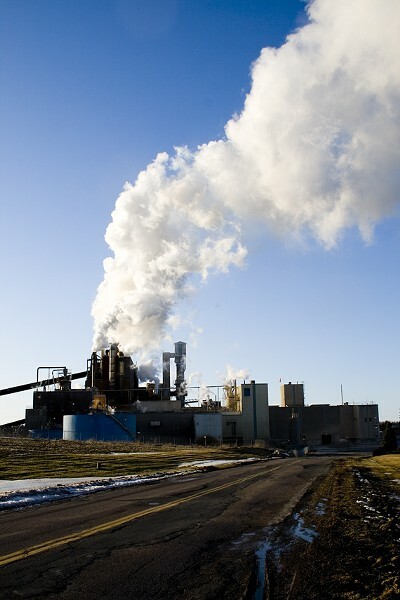 That same year, the province and the mill extended the treatment agreement to 2030. Band and mill officials declined to be interviewed for this article. At the end of 2005, the treatment operation was still going. In 2006, the deal was amended with December 2008 as the new cleanup deadline. 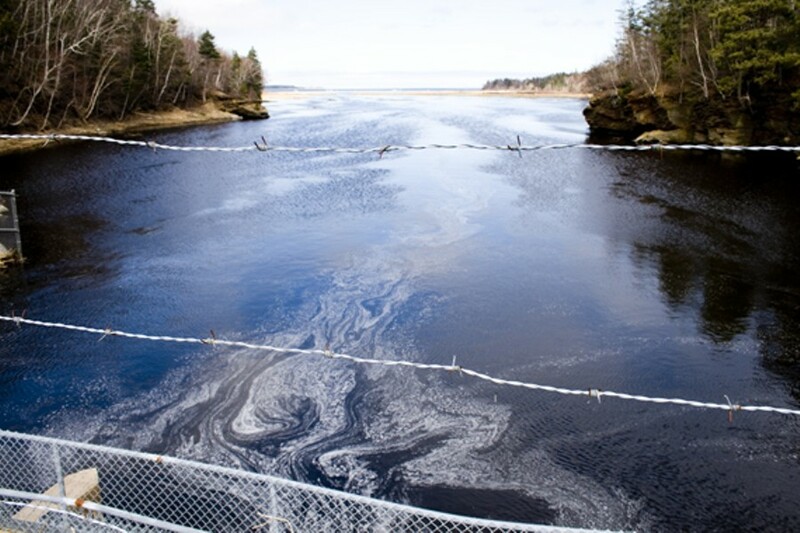 A provincial licence to allow continued pollution expired at the end of 2008, with pollution still flowing into Boat Harbour. Since then, there have been closed-door negotiations between the province, the mill and the band. The province has no idea how to clean up Boat Harbour. There have been a variety of proposals through the years, including a plan to pipe the waste directly out into the Strait. The most recent plan was to return Boat Harbour to its natural tidal state. The province filed an application under the federal environmental assessment rules and created a website, still posted today, saying this was the plan. But it had to shelve the idea and go back to the drawing board. Citing concerns of eutrophication---out-of-control algae blooms that kill off all other life---Chris Moir, of the Department of Transportation and Infrastructure Renewal, says turning Boat Harbour tidal might make the situation worse. "No one wanted to go ahead if eutrophication was a potential," says Moir. Whatever happens, the province is still on the hook for up to $12 million to dredge Boat Harbour and possibly $100 million for a new sewage treatment plant, although the federal government and the mill may contribute to the latter. However it plays out, MacKay will keep his cynicism. "We were told so many things that were proved to be untrue that now you don't trust anybody with any dealings with Boat Harbour," he says. "I don't think in our time we'll ever see it cleaned up." This special report was produced by the investigative workshop at King’s: Colin Parrott, Katie May, Zeb Qureshi, Tony Ferguson, Breanne McAdam, Vivian Belik, Zander Brosky, Stephany Tlalka, Terrence McEachern, David Olsen, Steve Davis and photographer John Packman.